Farro is one of those whole grains that I became acquainted with when I moved to Italy. While it is often referred to as Spelt, it is not entirely accurate to call it so. 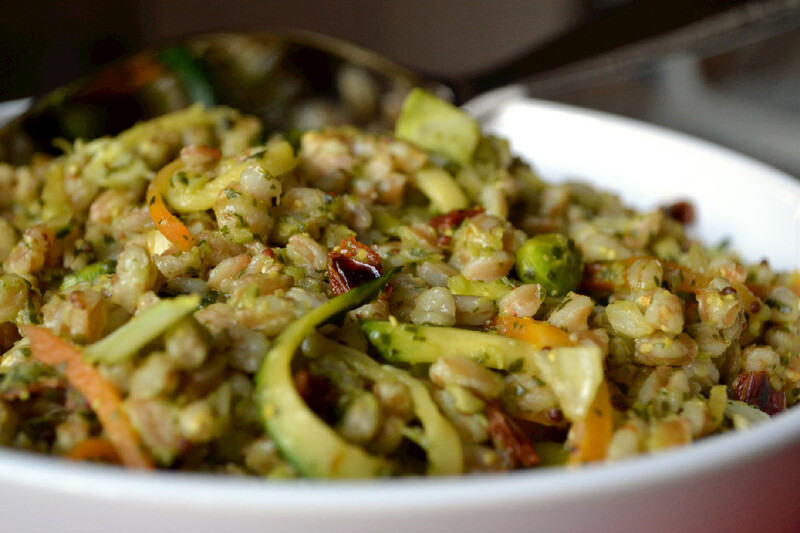 Italian Farro is Emmer, a hulled wheat grown in the regions of Tuscany and Abruzzo and has a similar texture to barley. It has a nutty flavour and retains a firm texture when cooked. This ancient grain dates back to Roman times and fueled Caesar’s army on their quest to conquer the empire. It is extremely nutritious, very high in protein, fiber, vitamins and has a very low glycemic index. Here in Italy, you find Farro used in soups during the cold winter months and salads during the warm summer months. You may also find it used to make Farrotto, a modern adaptation of the beloved Italian dish, risotto, made with Farro instead of rice. Farro comes in various forms including whole, hulled, semi-pearled, and pearled. The difference is in how refined the Farro is and how many layers of husk are removed. The more “whole” the Farro is, the more nutritious it is, the longer it takes to cook and the longer it needs to soak before hand. I typically use hulled or semi-pearled farro. 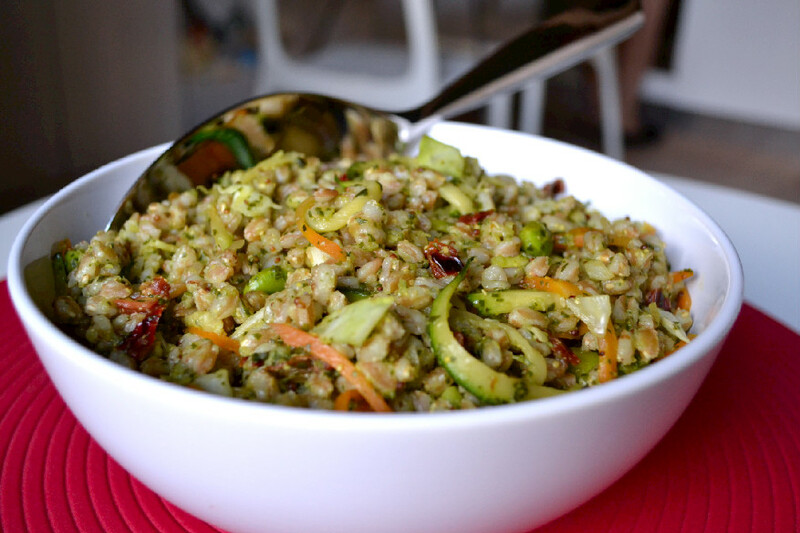 Hulled farro is the more nutritious of the two and needs to be soaked 6-8 hours before cooking. Semi-Pearled farro on the other hand does not need soaking, as the outer husk/brand has been removed and so it cooks a lot faster than hulled farro. Unlike rice which loses most of its nutritional value once the husk/bran is removed, semi-pearled farro retains a lot of its nutritional value. So if you’re strapped for time or haven’t planned ahead, you can use the semi-pearled variety without giving up much. I try to eat whole grains for at least two meals a day if I can and I like to switch it up. 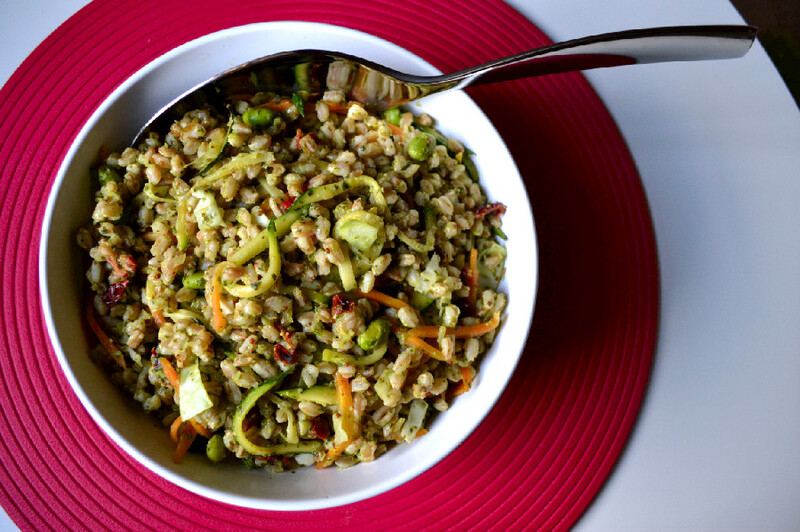 I have every whole grain imaginable in my pantry, including Farro. 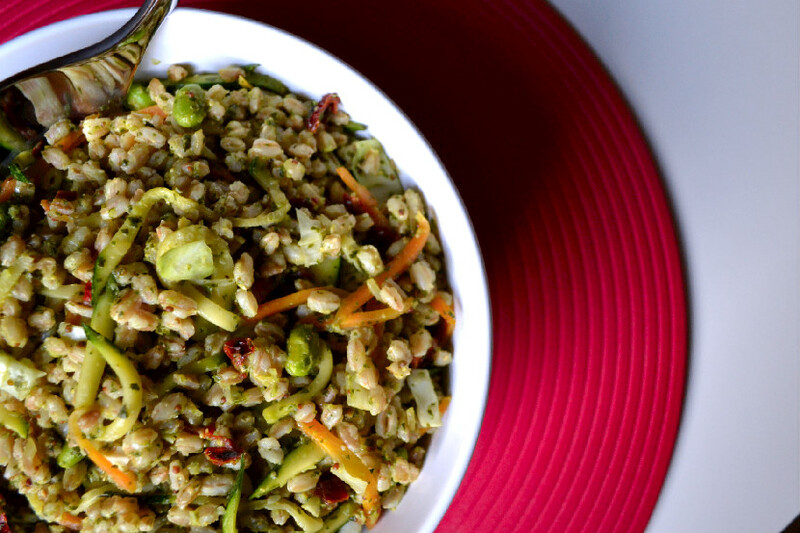 Here’s a great way to use this versatile whole grain. Sautee diced shallots and sundried tomatoes in EVOO for 2-3 minutes until shallots are transparent. Add carrots and edamame beans and sautee for 2-3 minutes until carrots are softened and edamame beans are warm. Add zucchini and sautee an additional 2-3 minutes until slightly softened. Remove from heat and transfer to a salad bowl and let cool at room temperature for 10 minutes. Serve at room temperature or chill in the refrigerator and serve cold. Sounds and looks so good, especially the sound of that dressing! I didn’t know that about the different farros, thanks for the info! Thanks so much! I’ve learned a lot about whole grains over the past year and I’ve become addicted to them. The dressing goes on anything from this salad, to mixed greens, pasta salad or veggies. Would love your feedback if you try it out. Thanks for stopping by. Hey, Nissrine! I just wanted to let you know that I nominated you for the Dragon’s Loyalty Award. If you haven’t heard of it, you can google it or you can head over to my blog to get an idea of what this is all about. Hope you decide to participate and congratulations on becoming a FBC member too! Hi Anna, thank you so much for taking the time to visit my blog and nominate me. I hope you enjoy the salad an dressing if you try them.